Love Live! Sunshine! 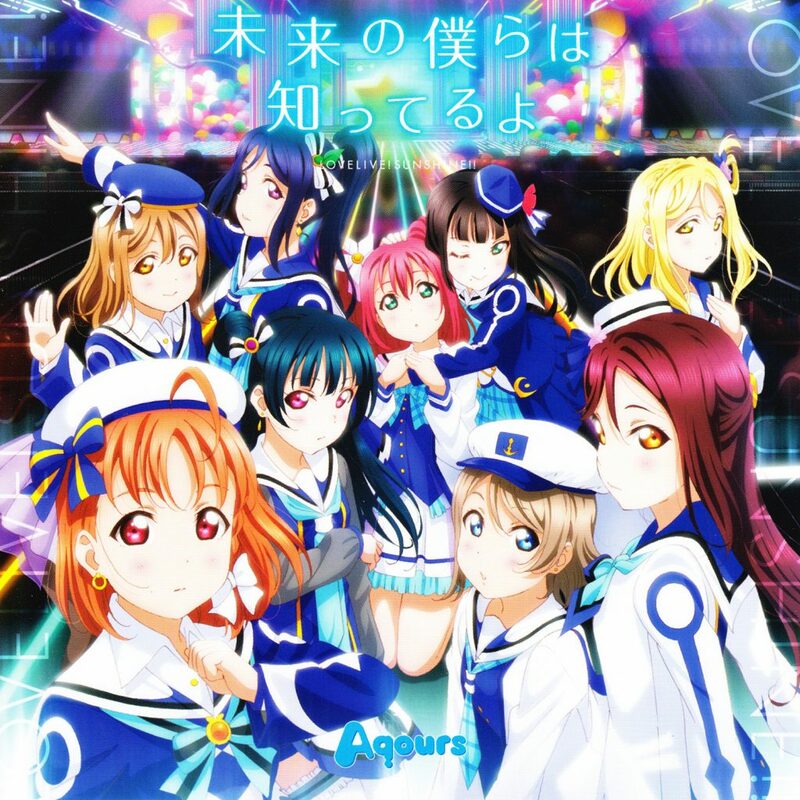 !’s Aqours are back to submerge us in idol goodness once again with their latest release Mirai no Bokura wa Shitteru yo. This two track (plus instrumental versions) single features the opening theme of the second season of Love Live! Sunshine! !, the titular Mirai no Bokura wa Shitteru yo and the slightly older, but not released until now Kimi no Hitomi o Meguru Bouken, which was used as an image song for a collaboration event with the Real Dasshutsu Escape Game held at Awashima Marine Park in Japan this spring. Mirai no Bokura wa Shitteru yo opens the single up with a bang, filling out its anime opening credentials with a raucous instrumental track and rousing chorus. The song takes the theme of looking positively at the future and embracing your dreams, rolling ahead with loads of energy and vibrancy. The girls certainly give it some gusto and it definitely inspires that “give it your all” feeling that idol music is known for. Stylistically, the song takes a cute approach; but is focussed on being a concert hall anthem structured to get crowds going with some call and response. This focus has seemingly helped shaped the overall sound which is sharp and punctuating with high pitch and volume. While this type of sound is commonly used in this style of idol music, it requires a lot of effort to pull off correctly and achieve the right balance. Sadly this is something that this track struggles with, as the vocals and instrumental track frequently try to outdo each other, meaning that several parts of the song muddy together into a single screech. It’s slightly surprising that the track ended up this way when they have got it pretty much perfect before, for example with Aozora Jumping Heart, which feels like it has that vocal/instrumental balance spot on. This is just a slight negative on what is a pretty awesome track, but it does mean that people who don’t like the high-pitched overly custesy style will perhaps not find it to their taste. The single’s B-side, Kimi no Hitomi o Meguru Bouken; takes a step back on this with a slower track with a cooler feeling. Trimming back the energy really helps to balance out the overall release – you couldn’t just stick another hyperactive track in here due to how strong Mirai no Bokura wa Shitteru yo is. Instead, we get a track that utilises the event that it was created for, creating an air of mystery while retaining core points of an idol song. The solo lines in each verse really help to flesh the song out and solidify the fact that there are nine people singing here – when you have large groups such as this it’s often hard to appreciate each individual talent in harmonies, so solos help to put the spotlight on each individual girl. That means no matter who you are a fan of, you’ll be able to get your fill. Both tracks come together nicely in what is a pretty good single for fans of Aqours and Love Live!. Issues with Mirai no Bokura wa Shitteru yo aside, they are great tracks to listen to and will stay in my Japanese music playlists for a while to come.